Phase-aligned radio and gamma-ray profiles of J1732−3131. The continuous blue line shows the 327 MHz average profile from 2014 observations and the dashed-dotted-dashed red curve shows the gamma-ray profile. The horizontal extent of the grey shade on either side of the radio profile indicates the uncertainty in phase corresponding to 1σ error in DM. For clarity, both the profiles are duplicated and plotted over a range spanning two rotations of the pulsar. Credit: Maan et al., 2017. (Phys.org)—A team of astronomers led by Yogesh Maan of the Netherlands Institute for Radio Astronomy (ASTRON) has discovered radio emission from the gamma-ray pulsar known as J1732−3131. 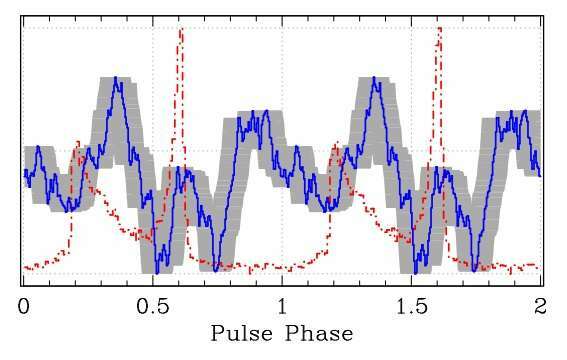 The study, presented in a paper published June 26 on arXiv.org, provides more details about J1732−3131, which was originally detected as a radio-quiet pulsar. Gamma-ray pulsars are rotating neutron stars emitting gamma-ray photons. Some of them also showcase radio emission that is often difficult to detect. This is most probably due to the fact that their narrow radio beams miss the sightline towards Earth. Located nearly 2,000 light years away from the Earth, J1732−3131 has a rotation period of about 196 milliseconds and is one such gamma-ray pulsar with hart-to-identify radio emission. The pulsar was found thanks to the data provided by the large area telescope (LAT) onboard NASA's Fermi Gamma-ray Space Telescope. So far, only a faint radio signal from this pulsar was detected at 34 MHz in 2012. More recently, Maan's team, motivated by previous faint detections, conducted follow-up observations of J1732−3131 between March 2014 and April 2015, using the Ooty radio telescope (ORT), located in Muthorai, India. This 530-meter-long and 30-meter-wide cylindrical paraboloid telescope allowed the researchers to observe the pulsar at 327 MHz, which resulted in detection of a faint periodic radio signal. "We report an extensive follow-up of the pulsar at 327 MHz with the Ooty radio telescope. Using the previously observed radio characteristics, and with an effective integration time of 60 hours, we present a detection of the pulsar at a confidence level of 99.82 percent," the authors of the study wrote in the paper. The astronomers estimate that the 327 MHz mean flux density of J1732−3131 is between 0.5 and 0.8 mJy and the spectral index in the range from −2.4 to −3.0. More importantly, however, the 1,400 MHz pseudo-luminosity of the pulsar is only between 2.2 and 8.9 μJy kpc2, which suggests that J1732−3131 is one of the least luminous pulsars known to date. According to the scientists, their research provides new clues about gamma-ray pulsars in general, which could improve their understanding of these peculiar neutron stars. They noted that some of the radio-quiet gamma-ray pulsars might actually be very faint radio sources, and therefore not detectable in the radio searches using current generation telescopes. That is why the researchers call for more studies of such pulsars using more powerful radio telescopes. "The high sensitivity of upcoming radio telescopes like square kilometre array (SKA) and the 500-meter Aperture Spherical Telescope (FAST) will enable radio detection, and facilitate better studies of such pulsars," the paper reads. SKA is a large, multi-radio telescope network being built in Australia and South Africa, which is expected to start initial observations in 2020. FAST is the world's largest filled-aperture radio telescope, located in China. It achieved first light in September 2016, and is currently undergoing testing and commissioning. Although originally discovered as a radio-quiet gamma-ray pulsar, J1732-3131 has exhibited intriguing detections at decameter wavelengths. We report an extensive follow-up of the pulsar at 327 MHz with the Ooty radio telescope. Using the previously observed radio characteristics, and with an effective integration time of 60 hrs, we present a detection of the pulsar at a confidence level of 99.82%. The 327 MHz mean flux density is estimated to be 0.5-0.8 mJy, which establishes the pulsar to be a steep spectrum source and one of the least-luminous pulsars known to date. We also phase-aligned the radio and gamma-ray profiles of the pulsar, and measured the phase-offset between the main peaks in the two profiles to be 0.24±0.06. We discuss the observed phase-offset in the context of various trends exhibited by the radio-loud gamma-ray pulsar population, and suggest that the gamma-ray emission from J1732-3131 is best explained by outer magnetosphere models. Details of our analysis leading to the pulsar detection, and measurements of various parameters and their implications relevant to the pulsar's emission mechanism are presented.